The color lavender has become our Jeni Strong color of strength this last month. Not sure “why” other than the fact that February is a special month to me, with Bentley’s birthday along with mine, my mom’s, and my niece and nephew’s! Our birth stone is Amethyst, which is found in a variety of beautiful purples. And our friends who designed our logos chose purple by divine guidance. Not-so ironically, I came to find out the Cancer Color for “all cancers” is lavender. Today, let’s pray with all those effected by any kind of cancer. Children, adults, families, and friends all around our world going through your journey; I pray you feel this color of strength wrap around you and smell the beauty of fresh flowers to calm any fears. I pray you experience a moment consumed in the presence of our Healer and Heavenly Father who knows you and your calling. While enjoying some fuller lashes this weekend, I am also wearing my Be Brave necklace from @rylieshore! I am encouraged to be brave each day and surround myself with shades of purple and all things beautiful, like all of you. June 14 2016: The First Good Day! I haven’t updated many since my terrible turn of events late last week so I apologize for that. I needed the weekend to grieve a little bit. 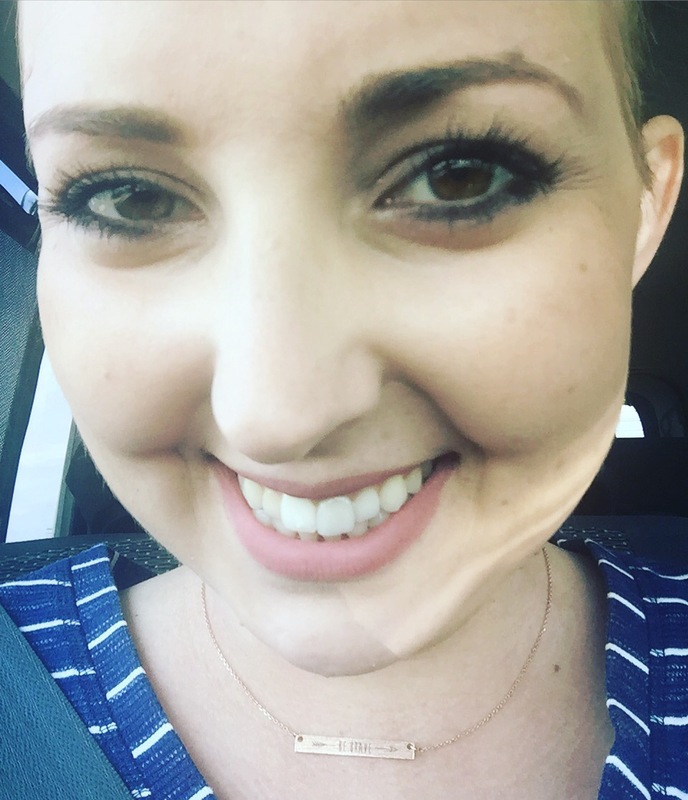 I went into last Wednesday feeling so strong in the plan: biopsy, clinical trial, calendar is nice and organized, radiation almost done, feeling nice and organized, oh yeah. Thursday (6/9): 48k still, running fevers. Not sure if I contracted pneumonia (had deep cough). Friday (6/10): 46k. No fevers (prayers answered). IVC filter procedure went well compared to first liver biopsy experience at Mercy where I felt everything and then was left in a room alone in pain with nor nurse in sight for 40 minutes. OU Doctor was great (kinda McDreamy which Adam agreed so I can say!) until he told me he was going into my vein through my JUGULAR and not my hip like the nurse told me (less risk for infection). Prayer and the loopy you’re out fast and won’t remember meds helped. Neck pain wasn’t too bad and I was able to unwrap it on Sunday. Was discharged from hospital Friday evening so was able to rest at home but struggled with headaches. 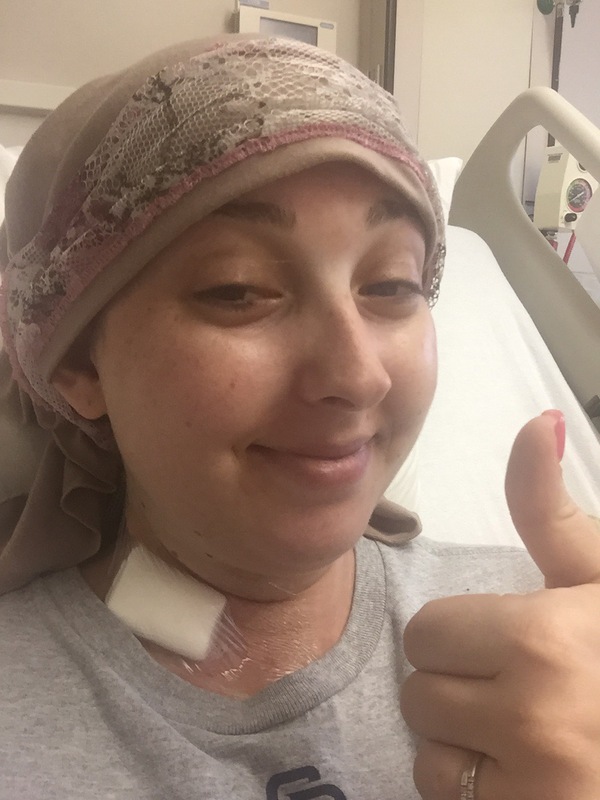 Monday (6/13): 43k and white blood cell count dropped for the first time. Bad day. Headaches were terrible all weekend from brain masses because I was told to stop the steroid (anti inflammatory) medicine but was given permission to get back on and taper off again later when full effects from brain radiation set in. Tuesday (6/14)! 56k and headaches gone. Woooooo. They let me do radiation (3 more sessions left) and seeing my tech team lifted my spirits. They rallied together more donations for our medical bill fund- who does that?! So much kindness. 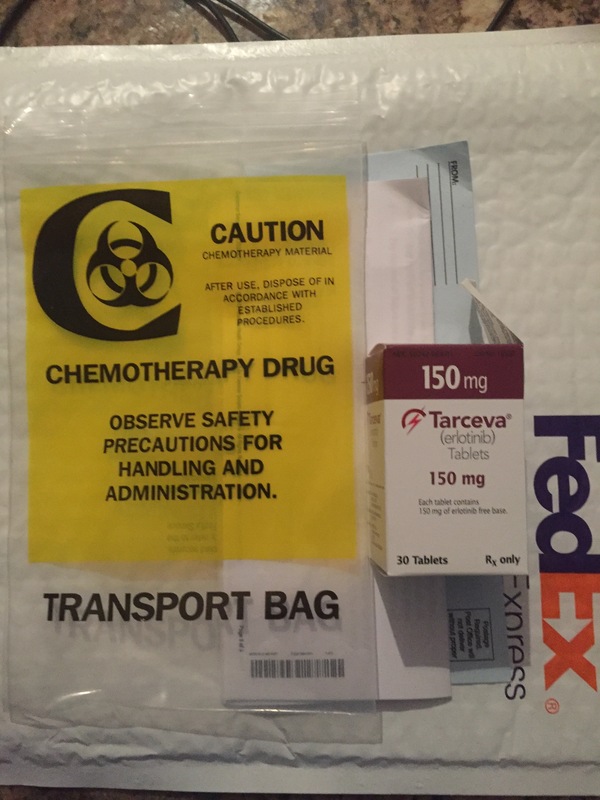 The biggest news other than my platelets is that my Tarceva targeted therapy “chemo pill” came in! It gets shipped once a month to me and since I was dropped from the clinical trial who was going to cover the cost of these $100/piece pills I was nervous to ask how much was covered under our insurance since it’s not like there are off brands of this cancer fighting therapy! All 30 pills cost us less than $20 a month, praise Jesus and great insurance! I take this beautiful life saver (lol) once a day on an empty tummy and let it do its thing! It even breaks through the blood brain barrier that regular chemo can’t penetrate! 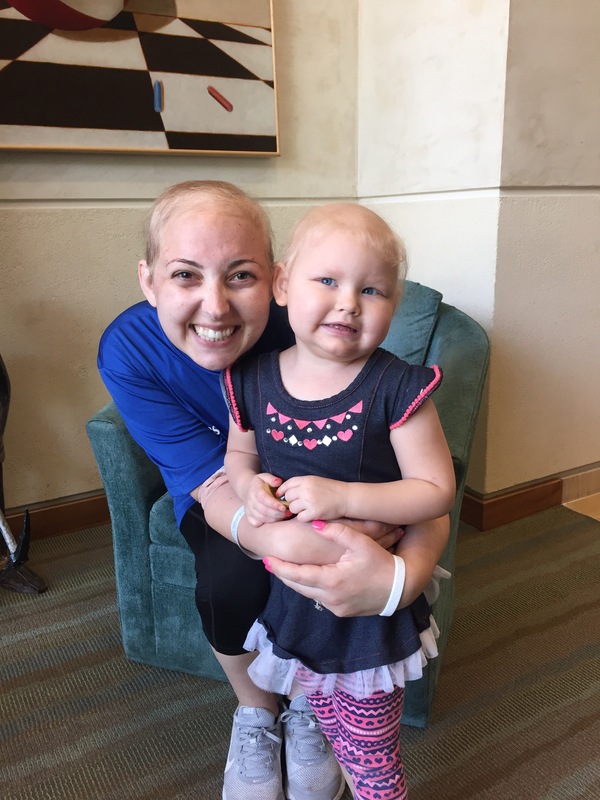 Lastly for this great day, I met a really sweet 3 year old, Haylie, at the Stephenson Cancer Center who was visiting just for one day of testing and new bone marrow/treatment set up from Tulsa where she goes to St. Francis Hospital for her care. She has Leukemia, diagnosed at a year and a half old. Her parents are actually from a town where my best friend’s husband and family are from so of course they knew eachother and small town Oklahoma stories always make me smile. Haylie has been through a lot but was so brave and we were able to spend time together talking about our matching pink nails and similar hair cuts. I hope to see you again sweet girl and I’ll be praying over you daily. Going back in at 8am for blood work check and radiation of above 50k! My beautiful mother Jeannie Kern has overcome health battles of her own in years past. Now, she has added to her angelic resume taking care of her own parents, both her daughters (my sister and I have had some strange health issues! ), and her newest grand daughter (Beni is healthy but Nana gets to spend lots of time with her these days while mommy fights!). God created this woman with so much intention. As the rest of you. But she is my someone special. I love you mommy. Today has been the toughest day on this journey so far. Friends, I ask that you stand with me and my family in intentional prayer tonight. iopsy into a dangerous potential bleed out situation. We thank God that the doctor I had followed procedure to check what he needed to beforehand and I was kept safe. Because we cannot biopsy the liver, I am no longer able to be in the clinical trial out of Yale because there are no other non invasive areas to get more cancerous tissue that hasn’t received radiation already. We thank God for the protection in this and trust I was not meant to be in that trial. My systemic treatment (Tarceva targeted therapy pills) will actually begin sooner now, which is great. In addition to the platelet issue, they found two blood clots in veins in both my legs, which is why I have been bruising and having swelling/pain in my legs and feet. I cannot go on blood thinners (normal care) because of my platelet levels. Therefore, I have been admitted to the hospital to have a surgery implanting a valve to protect the clots from moving up into my lungs. All is well, just emotional from so many changes in one day. Bentley came to watch the softball game with me (congrats OU!) and we praise each day for the love we have, whether at home or in a hospital. Thank you for praying with us for all those involved. This is not about me. Small surgery today so my clinical trial team has more tissue to work with as the last batch has all been used for original cancer v infection testing, diagnosis, cancer origination search, genetic testing, etc. Time to rise up! God didn’t save us to tame us. My two wonderful mothers Jeannie Kern Jeanne Roe Bruns and Bentley are my strength today. I have made some life changing friendships through the years in school (Temecula, CA, Tucson, AZ and Edmond, OK), working, my Edmond neighborhood, church (our women’s LifeGroup and people referring new friends over to our group that is hosted at my home bi weekly where we fellowship and follow the Propel Women curriculum together), and many other God-only ways. When I say these people are life changing, I mean it. What I know is that coming to know Christ made me NEW. Not a better version of me, but a BRAND NEW me. I think my “pre Christ” friends and family can attest to this, although I still make daily mistakes and fall short. So for someone reading this, please don’s confuse what being made new in Christ really means. Anyways, one way to know Christ and to feel this NEWNESS in life is through LOVE. Christ centered friends like mine LOVE on me in a way that is unconditional, constant, and real. They remind me of God’s love daily. They show up, they challenge me, they support me. 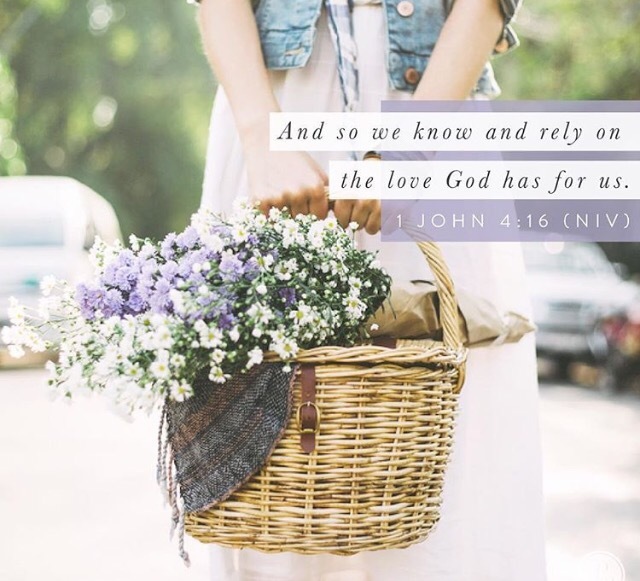 Some days I feel like I don’t deserve them and that love and then scripture reminds me that yes, I do deserve that and so does everyone else! Amazing. This last month, my friends drove me to radiation appointments, drove across the country to visit, checked in on me daily, prepared meals for our family, put together care packages, lit prayer candles for me in other countries, made handmade things like cookies and quilts (who does that???? not me! ), mowed our lawn, and prayed with us. We are forever grateful. I love you all. So very much. 1. I have qualified for a clinical trial being led by a doctor out of Yale! They will work with me/my team here in OKC right out of OU Stephenson Cancer Center: I have my own research team and the expenses are all paid for through their trial. We won’t know which group (test or control) I am in until June 14. Please join us in prayer that I am randomized into the test group so I may receive the “bi weekly antibody infusions” in addition to my targeted therapy systemic treatment pills. 2. I start my s ystemic treatment June 17, which was calculated on ending radiation and reducing steroid (for brain swelling) medicines appropriately. This treatment is not “chemo” but a specific (new) pill form of treatment Tarceva developed for my kind of stage 4 cancer with the EGFR gene mutation I was blessed with! Without that mutation, I would have been set on general chemos to try. eat area, hips, and right leg need 5 more days of radiation to shrink more masses so I am not at risk of fracturing bones or sustaining perm nerve damages, which is great because I can barely hold my baby without feeling like I’ll drop her through my numb right leg. Join us in prayer this week for these last 5 days of zapping! 4. My hair came out about 95% but since I won’t be on chemo it will grow back! My face and belly are super swollen from the first rounds of radiation but doctors said will go down soon. My other side effects have been much more manageable other than an increase in lack of sleep but everyone agrees it’s normal for my mind to be a little busy right now! 5. We feel GOOD about our plan. I am on specific researched supplements & a balanced diet and will be documenting all of the details on my page that is still in the works! 6. Doctors maintain there is no “cure” for my rare case but they’re also confident in the management moving forward.